When I was 12, my dad used to take my brother and me on these long bike adventures. We’d pack a snack and just ride our bicycles. Once we even ended up riding to my aunt’s house about 20 miles away. I was young and tired, so I caught a ride home with my mom. I loved those days of just riding. 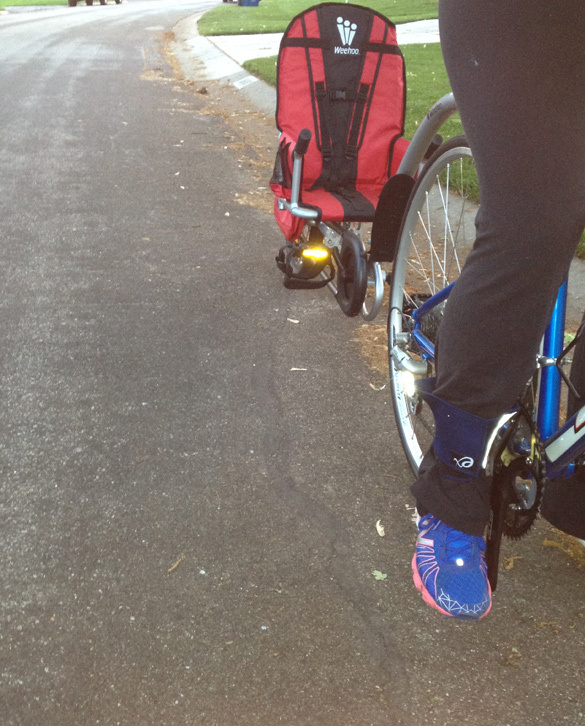 My son is still stop-and-go during outdoor activities — not always making it easy for me to keep going — so I was excited when the folks at Weehoo asked us to give their iGo Pro Bicycle Trailer a try. First up: Putting it together. It took two of us — okay, so I made my dad do most of the work! I did a few practice rides on our street alone before putting Evan into it. It is a little heavy to pull — 27 pounds — and definitely took me a few tries to feel comfortable. For others, please note this is my first time ever pulling anything on a bicycle. It may not be as time-consuming for those more familiar with using a bicycle trailer! I was nervous at first with the trailer only sitting on one wheel, but my balance felt pretty controlled. The more difficult part was getting Evan into the seat myself. My bike does not have a kick stand, and I would suggest using a bike with a stand. I do distance rides for fundraising purposes and like to keep my bike as light as possible. I did try leaning the bike against the garage to put him on, but my front wheel would kick out from under itself so my husband and I tag-teamed this. The seat adjusts easily without causing concern for safety and the harness is top-notch. I’m extremely appreciative of the height of the yielding flag so others are aware of a low trailer. Once Evan was in, we set the pedal straps to fit his shoe width and we were ready! This two-pedal trailer allowed Evan a little bit of control and a lot of movement. I enjoyed him being able to interact and pedal, rather than just coming along for the ride. I wore my ibitz activity tracker and bet Evan would’ve had some activity mileage racked up as well. For this active toddler, the pedals let him strengthen his muscles and recognize forward motion. I love how excited he was when he saw what he was able to do. He could make the bike move! This quickly sparked his interest and curiosity. Needless to say, he kept me riding for longer than I planned! 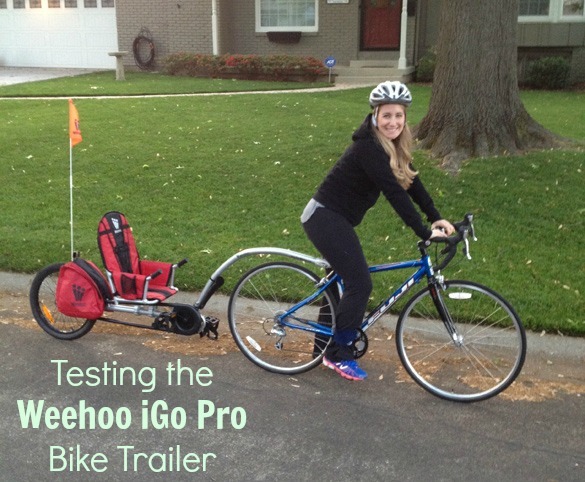 If you enjoy cycling and would like to with your little one, I would not overlook the Weehoo iGo Trailer ($399)! It is sleek and easy to adjust as your little one grows. The weight capacity goes up to 80 pounds, with an age range of up to 10 years. (It’ll start to become quite the workout the bigger your kiddo gets!) If you’ve got more than one child, they’ve also got two-seater models available. The most important thing for me is the comfort I feel with my mister riding behind me, and the ease of connecting and disconnecting it from my bike. One suggestion: buy yourself a mirror for your handlebar that can easily be placed on and off your bike so that you are able to check on your kiddo. I had to keep turning around and well — that’s not safe cycling! When picture time came, the child was no longer cooperating. While I was adventuring with the Weehoo, I also took time to give the StaySharp Commuter Cuffs ($15) a try as it was laundry day and my cycling shorts were stinky. If you’ve ever ridden a bike with pants, you know pants can get caught in bike chains — and I’ve seen accidents from cyclists getting wrapped up in their own chains. The cuffs are definitely one of those “Why didn’t I think of that?” products. 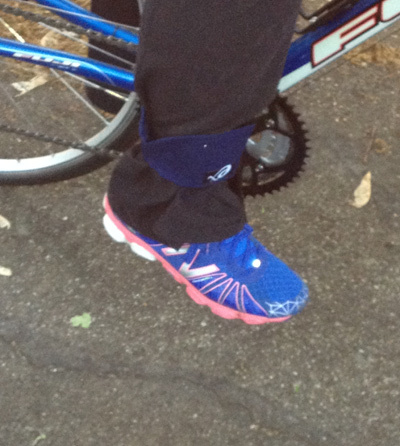 The cuff wrapped nicely around my ankle and kept my pants from getting in the way of my chain. The Velcro is tough enough to keep the cuff in place, and the material is thick enough to stay intact. So if you’re a bike commuter or tend to ride in long pants, your pants and shoelaces fear no more, you are all safe now with these cuffs!